If you only know one thing about Il Cattivo, it’s probably that its members played in a lot of Denver’s most respected heavy bands. Even so, there’s a lot more to the five-piece than its members’ collective résumé, even though bands like Planes Mistaken For Stars, Black Lamb, TaunTaun, and Ghost Buffalo turn up there. 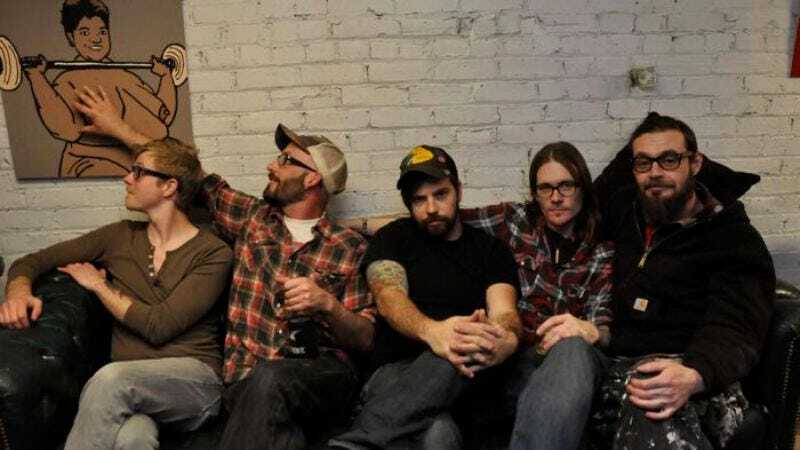 With the release of its debut, To Bring Low An Empire, Saturday June 4 at 3 Kings Tavern, Il Cattivo proves it’s more than just the sum of other bands’ parts. Guitarist Matt Bellinger spoke with The A.V. Club about bringing the heavy back to the Mile High City. The A.V. Club: With so many veterans from other bands in Il Cattivo, do you ever feel overshadowed by the band members’ collective history? Matt Bellinger: Possibly. The way I see it is that we’re fortunate enough to get a wider variety of people to give it a listen because of the projects we’ve done in the past. I feel strongly enough about it myself that I’m just happy with what has come out. It’s just exciting to be able to have this group of people to start writing with. I don’t really think about it as trying to start over or anything. I just feel that this is a new document of this space and time. These people are such a good influence, it’s been fun writing with them. AVC: Would you say making music’s about documenting the band and your life at any given point in time for you? MB: I’d imagine it’d be that way with everybody. It’s a relationship, and it’s not a girlfriend-boyfriend relationship. You’ve got five people to deal with—everybody’s egos and dramas and whatever’s going on in their lives. It’s definitely going to change. It’s constantly fluctuating, so you try to get the most out of it while you can. AVC: Is there a lot of ego and drama in Il Cattivo? MB: I just used that as a reference. With this band, we’ve tried to be very democratic with everybody. That’s something I’ve been able to learn over the years with everything I’ve done: You have to be patient and you have to drop your own ego as much as you can. AVC: Is that something you’ve learned through growing up or being in so many bands? MB: Definitely from being in bands with my best friends for eight or 10 years, and then being in a band with my ex-wife. All those different people have such different emotions going on, and you have to learn to deal with it. If not, the band’s going to implode. AVC: In Planes Mistaken For Stars and Ghost Buffalo, you changed your style a lot. Was it difficult to get back into the heavy-music groove for Il Cattivo? MB: For me, when [Ghost Buffalo] started, the idea was to do something with a country feel. I just needed a break from Planes, something different. Then after Planes was done, by the end of Ghost Buffalo, we were trying to get progressively more hard. We could only do so much with that. AVC: How has the musical landscape in Denver changed since you moved here in 1999 with Planes Mistaken For Stars? MB: I’ve seen that it’s up and down here. The one thing that’s stayed consistent since we moved here was that I like that there seems to be quite a lot of diversity and not much pretentiousness, which helps the community so much. I think that has pretty much stayed the same. It’s always fluctuating between styles and genres around here. There’s definitely a trend toward more dance-oriented and artier stuff. I try not to think about that stuff too much and just do what I’m able to do with the people I’m fortunate enough to write with. AVC: Il Cattivo translates as “the bad” from Italian. That seems to fit the type of music you make pretty well. MB: We originally thought it meant “the ugly,” because we got it from The Good, The Bad And The Ugly, the Italian version, but the translation was a little wrong. What we had found that the closest thing we can relate it to is it means “the horrid.” The bad, the evil, whatever. “The horrid” is the best description we’ve gotten. It fits the music pretty well. The more we found out about it, the more fitting we thought it was. AVC: To Bring Low An Empire features a painting by local artist Andrew Warner that perfectly fits with the act’s “the horrid” vibe. MB: I was wanting to ask him really bad to paint something for us, but my concern was money and whatnot. We went to him, and he was interested from the get-go. Ghost Buffalo and Planes both toured with him in Red Cloud. We’ve been friends forever. He came to the listening party at 3 Kings, and brought a painting he had done already. It made us all like calling the record To Bring Low An Empire that much more seeing the artwork involved. AVC: You now have a son, Miles. Does fatherhood change your approach to music or being in a band? MB: It definitely puts things in a different perspective. When I was in Planes, I remember the first time Gared [O’Donnell] told me that he and his lady were having a baby, I was so bummed out. That was when we were touring so much. I kind of bummed him out in my reaction. Now, I can see and feel what I put him through. I can see how much of a stress factor it is. At the same time, I’m excited to have something to document for my son to look back and see that I did what I wanted to, you know?